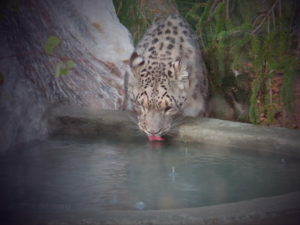 What does the snow leopard eat? Snow leopards eat meat. They primarily hunt wild sheep and goats. Snow leopards are also known to eat smaller animals like rodents, hares and game birds. 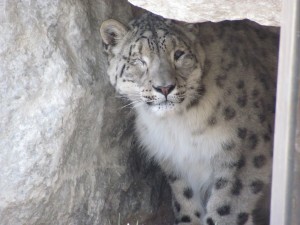 Snow leopards have been known to live up to 21 years in captivity. In the wild however they will only live to about 9 or 10 yrs. How many snow leopards can be born at a time? They live in the rugged mountainous regions of 12 countries – Afghanistan, Bhutan, China, India, Kazakhstan, the Kyrgyz republic, Mongolia, Nepal, Pakistan, Russia, Tajikistan and Uzbekistan. 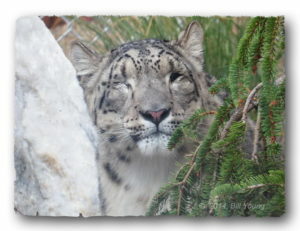 Snow Leopards are endangered. An estimated 3,500 to 7,000 snow leopards are left in the wild, with 600 – 700 in zoos around the world. They stalk their prey and usually spring from a distance of 20 – 50 feet. Their long and powerful hind limbs help snow leopards leap up to 30 feet, which is six times their body length. Mostly active at dawn and dusk, snow leopards are rarely seen in the wild. Unlike other big cats, snow leopards are unable to roar. 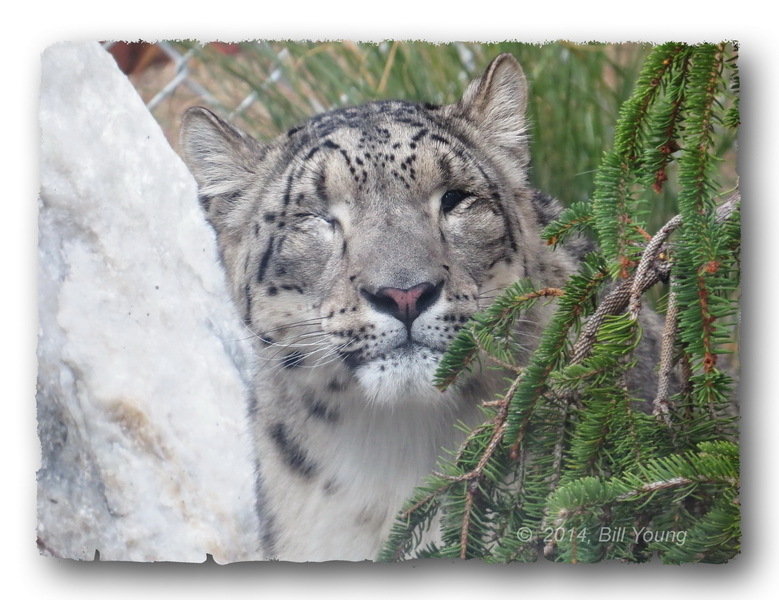 Female snow leopards are about 30% smaller than males.ual for big cats, who usually have yellow or gold eyes. Snow leopards are generally shy, even within their own species and will only seek out other snow leopards during mating season. Snow leopards can walk over 20 miles per day. On June 25, 2014, at 3:30 am, Asha and Shanti (Along with their keepers Deanna and Amy) flew into the Fed Ex terminal at LAX and were happily greeted by their new Curator and Big Bear Valley Recreation and Park District Administrative Staff. Both Snow Leopards were in large separate metal travel containers and they were scared. It took three hours to drive them to their new home in Big Bear Lake, CA and to their new beautiful enclosure that was completed just the day before. There were trees and bushes galore, a beautiful pool and a large den awaiting them. Once they were unloaded from the cargo van, they were placed up to the enclosure gate and the gates were open. Asha shot out and ran straight into the rock cave. Shanti was another story! She stayed in her travel container for 5 hours. Staff was trying to give her time to exit on her own terms, but it was getting extremely hot and we were worried about her health. With some extreme tipping, Shanti emerged and ran straight into her den. The two sisters took a day to find each other, and when they did, it was a grand reunion. The Snow Leopard sisters have settled in and are out on exhibit daily. They are most active in the morning and afternoon. They will remain with the Big Bear Alpine Zoo for the rest of their lives and act as conservation ambassadors. On May 2, 2012, at the Woodland Park Zoo in Seattle, Washington, three precious snow leopard cubs were born into the Species Survival Program to 7-year-old mother Helen and 6-year-old father Tom. The cubs were absolutely adorable. But they were more than just cute. They would live their lives serving as conservation ambassadors for an endangered species that scientists estimate numbers as few as 3,500 in the wild. Welcoming new conservation ambassadors into the world is always a joyous occasion, but the expert zookeepers and animal health staff at the Woodland Park Zoo had the tough realization early on that this birth was much more complicated. The three little cubs were facing health challenges. At six weeks old, the cubs had been well cared for by their mother Helen in their behind the scenes maternal den, but each of the cubs had displayed health concerns. One of the precious snow leopard triplets did not survive his turbulent first weeks. Unfortunately, the Veterinary staff had to make the difficult but humane decision to euthanize the male cub after they determined that the little guy had multiple, severe heart defects that were causing early heart failure that could not be treated with drugs or surgery. The staff was heartbroken by this loss but quickly focused all their attention on the two surviving sisters who faced their own challenges; a diagnosis of a relatively rare congenital eye anomaly. Ultimately, Asha and Shanti would develop functional vision only in their left eyes. The girls both exhibited multiple ocular coloboma is a relatively rare congenital eye anomaly affects both human and non-human animals in which the eye stops growing before it is fully developed. This left the girls each with functional vision only in their left eye, and ultimately each had their right eye removed to prevent infection and future complications. Working with the Species Survival Plan (SSP), a collaborative effort to manage species populations across conservation zoos, Big Bear Alpine Zoo was chosen to be their new home that would fit Asha and Shanti’s unique needs. At Big Bear Alpine Zoo, which is known for its wildlife rehabilitation program, Asha and Shanti will be able to remain together and continue to receive specialized medical care. Looking into Asha’s and Shanti’s eyes, one’s initial sadness is quickly replaced with wonder and amazement at their zest for life. Every day is a new adventure on their journey to inspire us to learn, care and act to save their counterparts in the wild.